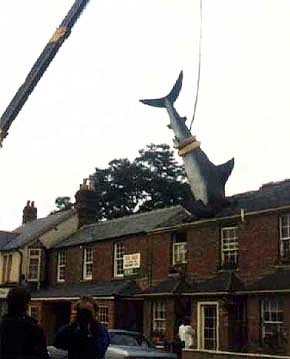 The Shark became the most famous resident of Headington when it landed in the roof of 2 New High Street in the early hours of Saturday 9 August 1986. This ordinary home (built as a semi-detached house in about 1860 but now attached by a link to a second house to the north) suddenly became the centre of world attention, and the headless shark still excites interest today. The shark was to express someone feeling totally impotent and ripping a hole in their roof out of a sense of impotence and anger and desperation…. It is saying something about CND, nuclear power, Chernobyl and Nagasaki. The headless sculpture, with the label “Untitled 1986” fixed to the gate to the house, was erected on the 41st anniversary of the dropping of the atomic bomb on Nagasaki. Created by the sculptor John Buckley, it is made of fibreglass, weighs four hundredweight, and is 25 feet long. 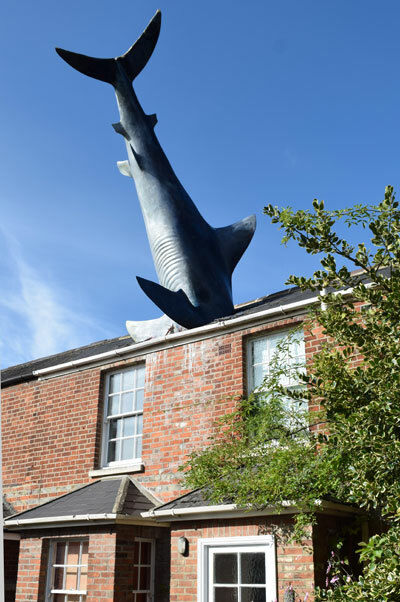 Oxford City Council tried to get rid of the shark on the grounds that it was dangerous to the public, but engineers inspected the roof girders that had been specially installed to support it and pronounced the erection safe. The council then decided that the shark was development within the definition contained in Section 22 of the Town and Country Planning Act 1971, and that as such it had to be removed. Their offer to display it in a public building such as a swimming pool was not, however, accepted by Bill. Bill played for time, but on 23 January 1990 he submitted a planning application (90/00084/NF) for “Retention of public sculpture 'Untitled 1985' (fibregalss shark through roof)”. This was refused by Oxford City Council's Planning Committee on 14 November 1990, with Andrew Adonis (now Lord Adonis) the only Oxford city councillor voting in favour of it. It is not in dispute that this is a large and prominent feature. That was the intention, but the intention of the appellant and the artist is not an issue as far as planning permission is concerned. The case should be decided on its planning merits, not by resorting to “utilitarianism”, in the sense of the greatest good to the greatest number. And it is necessary to consider the relationship between the shark and its setting…. In this case it is not in dispute that the shark is not in harmony with its surroundings, but then it is not intended to be in harmony with them. The basic facts are there for almost all to see. Into this archetypal urban setting crashes (almost literally) the shark. The contrast is deliberate … and, in this sense, the work is quite specific to its setting. As a “work of art” the sculpture (“Untitled 1986”) would be “read” quite differently in, say, an art gallery or on another site. An incongruous object can become accepted as a landmark after a time, becoming well known, even well loved in the process. Something of this sort seems to have happened, for many people, to the so-called “Oxford shark”. The Council is understandably concerned about precedent here. The first concern is simple: proliferation with sharks (and Heaven knows what else) crashing through roofs all over the City. This fear is exaggerated. In the five years since the shark was erected, no other examples have occurred. Only very recently has there been a proposal for twin baby sharks in the Iffley Road. But any system of control must make some small place for the dynamic, the unexpected, the downright quirky. I therefore recommend that the Headington shark be allowed to remain. There is nothing about smiling in the analects of the planning committee of the Oxford city council, and that august body ruled that it must come down, giving as the reason that it had been put up without planning permission, or more likely just because it was delightful, innocent, fresh and amusing — all qualities abhorred by such committees. On 26 August 2016 Bill Heine's son Magnus Hanson-Heine bought the Shark House, and explains here in the Guardian of 12 March 2017 why he did so. Since 2018 he has run it as an AirBnB property for twelve guests. A decision is due to be taken by Oxford City Council on whether to add it to their list of heritage assets. Bill Heine died on 3 April 2019. The shark was the second headache that Bill gave the Oxford city planning department. The first related to Headington Cinema (which used to stand on the opposite side of New High Street to the shark, where Standon Court is now). The previous owner had named it the Moulin Rouge but failed to get planning permission to put up a turning windmill on the grounds that this was misleading, as there were no can-can dancers. Bill took over the cinema in 1980 and put up an enormous pair of can-can legs (sculpted, like the shark, by John Buckley). When the planners predictably objected on the same grounds, serving enforcement order 82/00144/E, Bill promptly changed the name of the cinema to “Not the Moulin Rouge”, stating that a pair of can-can legs could not advertise anything which was patently not the Moulin Rouge, and he eventually got away with it. This cinema came under the aegis of Bill’s Penultimate Picture Company, which also ran the Penultimate Picture Palace (now renamed the Ultimate Picture Palace) in Jeune Street, Oxford and the Duke of York’s Cinema in Brighton. When the [Not the] Moulin Rouge in Headington closed in 1991, the legs were transferred to his Brighton cinema. In 1994 the Penultimate Picture Palace Company collapsed.